Sears Canada names Unitas as new AOR | Marketing Magazine. Nobody, really, had ever heard of Unitas Reputation Management/Services/Communication/Agency (their online SEA doesn’t seem to include focus), except presumably the wise men at Sears. But it’s nice and it’s a start-up and their “context” is, of course, brilliant (who would have thought of trying to get enthusiasm for the clients among “all the people who influence their success – customers, employees, allies* and investors?) 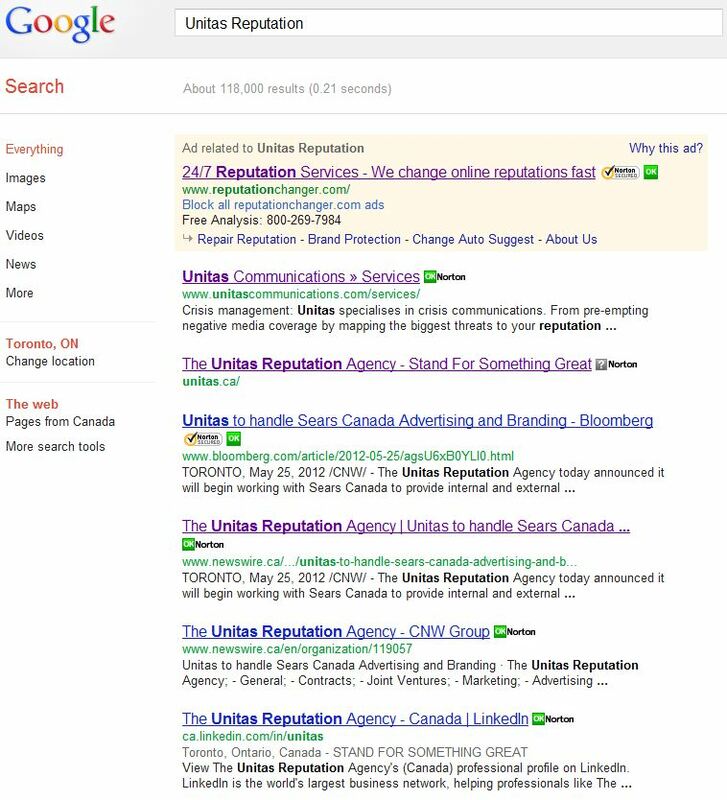 Of course, it’s entirely possible that searching for these search experts will lead to another Unitas Communication Reputation Management agency, altogether, but that’s probably an intentional oversight. Try to guess which Unitas is the Unitas Sears are hooking up with. It’s hard to believe that these guys did not Google the name to see how many other companies by the name of Unitas co-opted the “Reputation Management” discipline (from its original PR application and it’s down market cousin, “Online Reputation Management”). Actually, there can be no doubt that Unitas Communication (US) Unitas Reputation (Canada — see, I got it finally, communication versus reputation, not confusing at all) are excellent at managing reputation and creating enthusiasm (although, to be honest, again, I thoroughly doubt the Canadian version has any clue how to change the culture of an organization as culturally entrenched as Sears, but, hey, it’s worth a try). But, whatever happened to retail marketing! What makes great retailers great? It starts with unique, relevant merchandise. Ask the Sears hardware and automotive merchandisers. If you don’t sell it, they won’t buy it, no-matter how enthusiastic you or anybody else is. Then, it’s useful to be where the customer is, location, both real and virtual. Then, it’s important to tell the potential customers that you have the stuff they want (and stuff they don’t want — remember surprise and delight) where they want to buy it. this is an old-fashioned idea, called advertising (call it whatever you want, but it’s advertising and without it you’re fxcked). Then, you need to manage the relative value proposition: is the sticker price they pay right taking into account the quality of the merchandise, the satisfaction (may I say it, enjoyment) of the experience, the after-sales promise and all of this relative to the competition. Brand is the degree to whether this entire experience is positively imbeded as an expectation — if it is, you will be heard and believed, if not, you will be ignored or, worse, disbelieved, disdained and dismissed. Enthusiastically, probably. Internal branding — not a new idea at all — is critical at all phases, because of the importance of the experience. But so is advertising, brand and tactical. Or, perhaps none of them — take Costco as an example, they do neither and they’re not doing too badly. My point? It’s just plain weird for a retailer whose business is falling through the floor (or not — Sears business falls and rises like a yo-yo) to hire an agency that prides itself on the po-mo fad of “reputation” management, and to do this over the phone without benefit of a review!! I might agree with the man from Sears that they can’t advertise their way out of the hole (or not-hole). But they can’t reputationise themselves out of it either. A real review, based on a real brief resulting from deep and honest soul-searching, among the leading experts in retail turnaround (and, if they aren’t in Canada, then wherever they are) would have been the right thing to do: right by the people who work for them who (in addition to being enthusiastic) want to be employed; right by the shareholders who have some legitimate concerns that they are expressing in radical ways (and if this is about a LBO, then they are even more in the wrong direction — think “fill the till”); right by the communities they are in (that can really do without losing more jobs and stores); right by the country (we really don’t need to see another brand bite the dust); and, of course, right by their customers (who, let’s face facts, in the end don’t give a damn because they can always get exactly the same stuff elsewhere — except maybe with less enthusiasm). In honour of the time-honoured tradition of go and see what the people who are winning are doing, Sears might wander over to The Bay and see what they’re doing. I doubt Bonnie Brooks or Richard Baker (Lord and Taylor and HBC) will be turning over their marketing communications and consumer strategy to a “reputation agency” on the basis of a phone call. But then, perhaps the enthusiasm for success at the management level is such that they are fixated with getting it right the first time. *By the way, what’s with this “Allies” silliness in the “context”?